Suddenly, it’s April. No one I know can quite figure out how we got here already, but hey, it’s the fourth month of the year. Spring has sprung, and so have morel mushrooms. Morels should be cooked before being eaten, and many people enjoy them sauteed in butter with a bit of salt and pepper. I’m all about sauteing mushrooms in butter — and I did that as part of my preparation — but I thought a pizza that showcased the first flavors of spring would be just perfect. Along with morels, the first asparagus is presenting its green, tender shoots. With the warmer weather, Pennyroyal Farm is also back to making their Laychee cheese, the light, fluffy stuff that they make from new milk. To finish off the flavors, this pizza-of-the-spring was put on a “crust” of garlic naan, given a white sauce cover, and graced with some pancetta. It was incredibly delicious. Pair it with Pennyroyal’s sister ranch, Navarro Vineyard’s, Pinot Noir (2011 was a very good year) and toast the fresh, new world. On the stove top, put milk and butter in a small pot over medium heat. Whisk in flour. Stir until flour is mixed thoroughly. Mix in white pepper and garlic. Add cheese and remove from heat. Whisk until cheese is melted and set aside while you cook the morels. Place naan on a pizza stone, pizza pan, or cookie sheet. Spread white sauce evenly over each piece. Place pancetta on top, then follow by scattering the asparagus and morels. Dollop each naan with the cheese, placing strategically so each bite will have some gooey goodness. 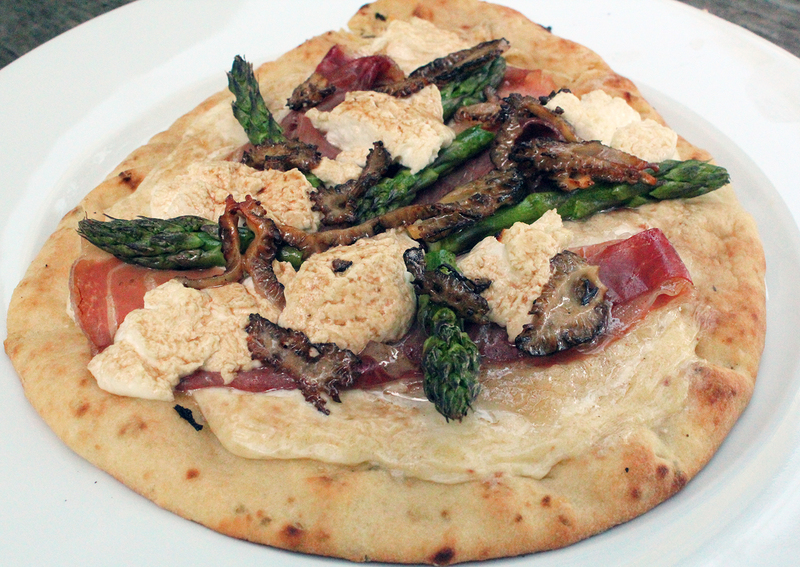 Put naan pizzas in the oven and cook seven to 10 minutes or until the asparagus begins to brown. After about five minutes of the pizzas being in the oven, spritz the tops with balsamic vinegar. Cut each pizza in pieces and serve right away. The West is really warming up. There are places already experiencing 100 degree F days, and it’s not even June! It may be heating up, but that doesn’t mean the time for soup is over. There are tomato gazpachos, fruit soups, and more. Since it’s not so hot — yet — that no one even feels like eating, a heartier chilled soup seemed in order. 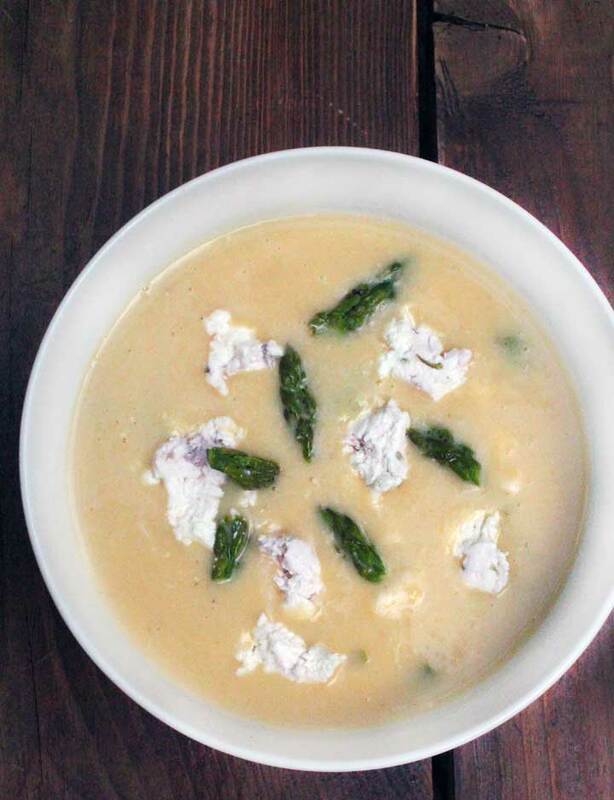 Inspired by Cowgirl Creamery‘s amazing Spring Garlic and Asparagus Soup, I made a version that incorporated my seasonal farm share from Pennyroyal Farmstead. This thick, creamy, and decadent meal paired perfectly with a slightly creamy Sauvignon Blanc, Husch’s “The Press,” a secondary label they created for the 2012 vintage. 2012 was a wonderful year with an amazing yield. Its grassy, citrus nose and lemon custard in the glass paired — as I said before — perfectly with the asparagus and goat cheese in the soup. Over medium heat, melt butter in a soup pot. Toss in garlic, potatoes, and onion and stir. Cover with a lid and cook for about ten minutes, stirring occasionally, until potatoes are soft. Add stock and bring to a simmer. Continue to simmer for ten minutes. Turn off heat and stir in crème fraîche. In a large bowl, create an ice bath with ice and water, setting a slightly smaller bowl inside. In one cup increments, purée the soup in a food processor or blender. Pour into the bowl inside the ice bath. Place into the refrigerator and wait for soup to chill. In the same soup pot, bring 4 cups of water to a boil. Throw in asparagus and cook until it becomes bright green but is still just a bit crunchy. Drain and dry in paper towels. This is my favorite tip from Cowgirl Creamery — instead of blanching the asparagus, toss it with olive oil and the salt and pepper. The asparagus absorbs more flavor while it’s still warm. I found this to be quite true! 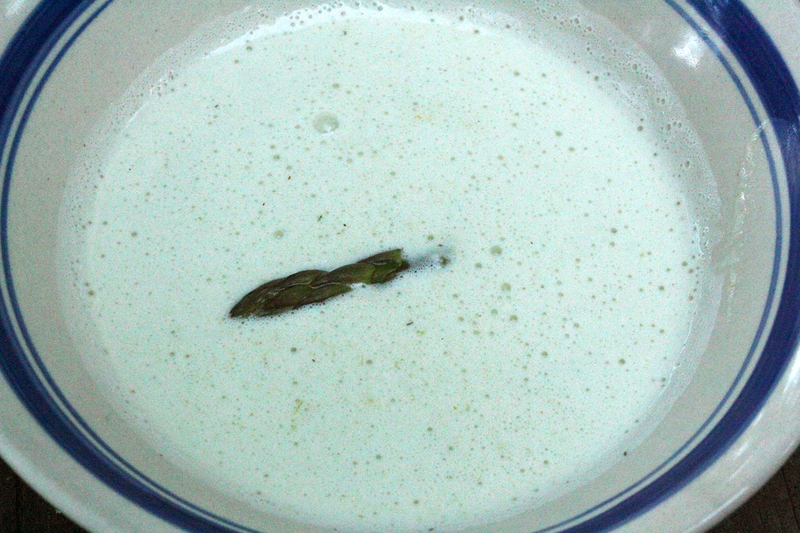 Put asparagus in a container and place in the fridge until ready to add to the soup. When soup is chilled, pour into four bowls. Stir in asparagus, reserving tips for garnish. Dollop in small spoonfuls of Laychee. Garnish with asparagus tips and serve. Yesterday was Pi Day, so in celebration, I made us a savory pie, i.e. quiche, for dinner last night. Honestly, could I have done anything else? This year’s math day also occurred when spring has sprung in California. (Sorry if you’re not there yet in your neck of the woods.) There are tender, green veggies all up in the place right now, so I figured our savory pie required more than a serving of vegetables to fully celebrate 3.14 as well as the changing of seasons. Inspired by the technique used by theKitchn, I assembled this quiche a bit differently than I have in the past and was quite happy with the results. 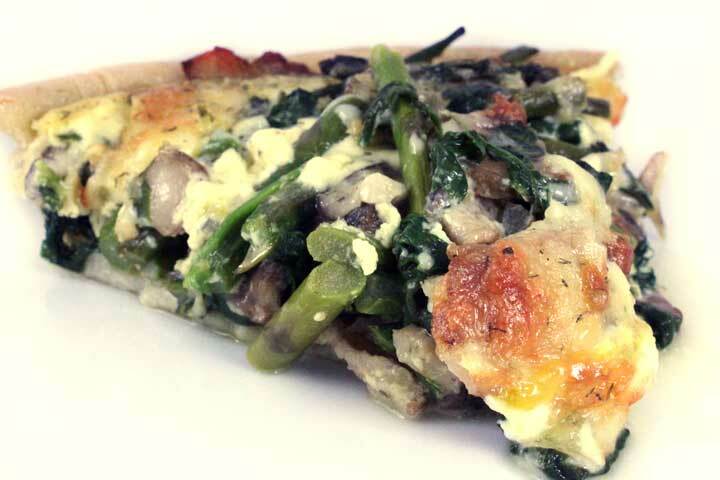 We paired our spring quiche with a glass of Riesling. The bright acidity stood up to the green flavors of the pie and kept the custard and cheese from being too heavy. Cook crusts according to package directions. Keep oven at 350 degrees F after removing the pie shells. In a large skillet, cook bacon until browned. Add red onion and stir. Pour in mushrooms and stir. Scatter asparagus and cook two minutes, then stir. Sprinkle spinach on top and cook for two more minutes. Stir veggies until spinach is wilted and then pour everything into a colander and let drain. In the baked pie shells, scatter half of the cheese. Pour the veggies and bacon into each crust. Scatter the other half of the cheese on top. In a large bowl, beat eggs, cream, milk, and seasonings together. Pour an equal amount into each pie shell. Put into oven and cook for 40 minutes. Cool for 20 minutes. Cut into wedges and serve with a nice, dry Riesling. We have an odd combination when it comes to in-season produce right now. Blood oranges and asparagus are neck and neck in the race for most-local. This combo was too tempting to pass up — imagine the citrus-sweet flavors with the woody green wonder that is first-of-the-season asparagus. I’m surprised I can hold myself together. Combine curry, season salt, sage, cardamom, nutmeg, and ginger in a small bowl. Stir. Loosen the skin above the breast meat. Rub olive oil over and inside the chicken. Rub herb mixture inside the loosened skin, then rub inside cavity and over the outside of the bird. Cut oranges in half. Squeeze juice inside the loosened skin, cavity, and outside of bird then place all four halves inside cavity. Bake at 325 degrees for two and a half hours, breast down. Flip chicken for the last hour of cooking. Take chicken out of the oven and rest. 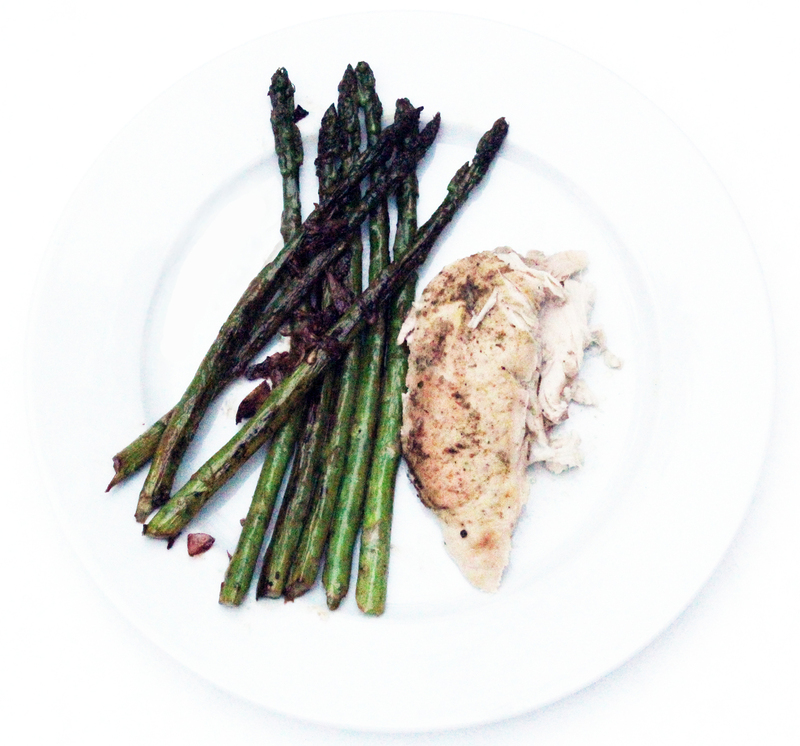 While chicken is resting, cook asparagus. Saute scallions in 1 TB butter. After one minute, add the juice of half the orange. Stir. Add the asparagus, other TB of butter, and season salt. Saute until asparagus begins to brown then add juice from other half of blood orange. Stir. As soon as the liquid reduces and asparagus begins to caramelize, remove from heat.